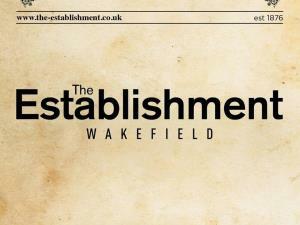 The Establishment BarWith it’s scrubbed pine floor, bare brick and tile walls and innovative light fittings, The Establishment is the place to go in Wakefield if you want a great night out. Big picture windows let you to watch the passersby walking along Westgate as you sip your cocktail and enjoy a slice of pizza from the authentic pizza oven behind the bar. The innovative glass-fronted cellar mounted on the wall allows you to see the beer flowing to the pumps. The bar, on the corner of Bank Street and Westgate, is housed in what was Buzz Bar and is a part of Unity Hall. Owners Unity Bars and Clubs have spent many thousands of pounds restoring the Grade II-Listed building and have unearthed some real gems, including a cobbled street which we have integrated into the design.